Need to Vent! — Movie Reviews with a Twist: GET READY FOR THE SECOND COMING! No friends and neighbors, it isn't time (yet) to gather 'round the river so we can present Jesus with his very own PlayStation 3 (or whatever the fine folks at nearby Faithville feel is appropriate). Instead, this glorious headline from MSN's UK correspondent, Brian Laban, announces the arrival of the second-generation MINI making its first public appearance. Just 4 1/2 years after the intitial re-introduction of this British classic, the fun-loving fellows at MINI simply couldn't resist making an already grand vehicle even more grand. As a result, sales are expected to continue to exceed all predictions for years to come. (The MINI plant in Oxford has never been able to keep up with the demand, consistently running at double the original estimates). Although the changes are visually subtle, this totally new MINI is completely redesigned; in fact, every external body panel and every external detail except the MINI badge has been changed. 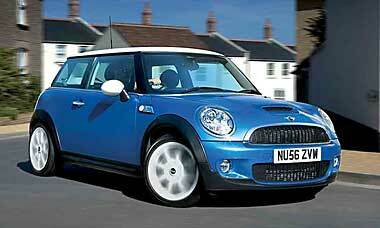 With a more powerful, now turbocharged engine, the MINI S model is even quicker and more fun to drive than ever. Holy jumpin' Jehosaphat! 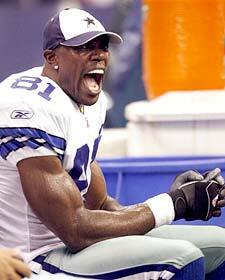 Speaking of things large and small, and now turning from the sublime to the ridiculous, I couldn't help but notice recently the horrendously enormous size of Terrell Owens' yapper. Could there possibly be a bigger human orifice anywhere? Probably not. What I do know is that the last time anyone saw a mouth this big Jonah disappeared.